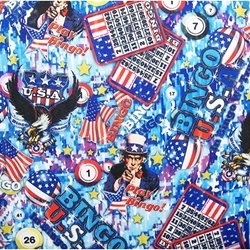 Does your love for America match that of your love for Bingo? Prove it with this seat cushion that shows both through and through. This double seat cushion has a seat flap on the back. The foam inserts in this double cushion are roughly three inches thick. There is a handle on both ends of the cushion for ease of carrying. Each cushion measures 13x13.5x3". Two of these are fashioned together by 2.5" of patterned fabric.